This is the kind of damage that can be inflicted on a tilter door by a jealous husband with a people mover. The door was replaced the next day. The axle of this 27 year old door wore through completely and broke allowing the door to free fall 1.2 metres at one end. Fortunately it stayed up there but the inconvenience caused major problems. A regular service would probably have detected the problem before it got to this stage. A true story. 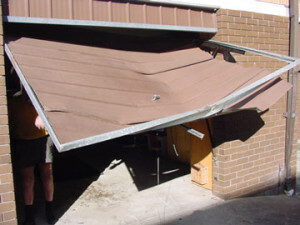 A customer of ours recently bought an established home on the central coast of NSW and discovered that it had not been set up correctly resulting in him being trapped under his garage door. He had been working in his garage when he was called for dinner, he closed the garage door as he walked out. He then realised that he had left his remote control handset in the garage and decided to hold the still moving door back and the sensitivty would stop and reopen the door for him. 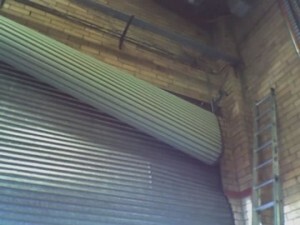 Unfortunately the installer of the garage door had not set the sensitivity at all and the door kept closing. As the door got closer to the ground he used his foot to hold the door back. The door kept coming and eventually hit the ground with his foot firmly trapped underneath it. Great pressure was being applied to his foot causing him quite some pain and concern so he decided to use both hands to hold the door up enough to free his foot as the pain was getting rather bad. He bent down and attempted to lift the door, he managed to release the pressure enough to slip his foot out, but wasn't quick enough to slip his hands out before the door slammed shut trapping him again, this time by the fingers. Feeling rather stupid and seeing no one else in the street, he shouted for his wife. Mrs. customer was unfortunately watching the television in the back room of the house and couldn't hear his anguished cries. Imagine the potential harm and indignity that could be caused to a senior citizen trapped by the fingers being crushed under the door. Feeling his fingers swell up and realising he had no other way of escape he jerked himself free from his door. Bloodied and probably embarrassed he went inside to clean up. The moral to the story, which is a true story, is to have your garage door checked on a regular basis by a professional installer. Keep watching this space for interesting pictures and stories of damages and poor installations that could have had disasterous consequences, we see them regularly and will now put them on this page for your amazement.